I am interested in species interactions within animal communities. I am studying currently interactions within mixed-species flocks of birds. My aim is to understand how seemingly different species of birds come together to form a single large unit of a mixed-species flock and how interactions within these affect participation of flock members. I am also trying to understand species roles in flocks, specifically pertaining to the intraspecifically gregarious species and sallying solitary species. I aim to determine what influences species importance in flocks and also how the costs to some species affect species participation in mixed-species flocks of birds. Coming from a large extended-family of engineers, I was probably on my way to becoming one of them until my interest in outdoor activities like hiking - encouraged by my parents - took me to the Western Ghats. After a Bachelor’s in Microbiology, I decided that the closed lab space did not engage me as much as the outdoors. My interest in avian ecology was set once I was handed an old pair of binoculars that I inherited from my eldest cousin. It still remains one of my most treasured possessions. While we know that both ecological and evolutionary factors drive the distribution of species along elevational and latitudinal gradient, their effect on the distribution of species as mediated by species-specific traits has received far less attention. Different groups with varying life histories, traits and adaptations are likely to behave differently in response to their environment. My study focuses on the spatial variation of plant traits along a latitudinal gradient in the Western Ghats. Further, my study also examines how these patterns contribute to plant species richness along the gradient and how species traits influence the geographic range size of species. I am from Darjeeling, West Bengal. I am a nature lover and I love photographing, identifying and documenting plants. I am interested in marine snails that are found in the interface of land and sea. As adults these are very restricted in their movement but produce larvae which can traverse surprisingly distances. These larvae ride ocean currents and can drift several hundred kilometers before finding a suitable spot and growing to be a sedentary adult. I study how different populations of these snails are related to each other using tools in genetics, and interpret these patterns in the light of habitat distribution and prevalent ocean currents. My research focuses on snails from the family Littorinidae and Conidae and takes me to rocky shores, mangroves and subtidal habitats. I come from a background in microbiology and genomics and was drawn to ecology from a sense of wonder for the natural world – the diversity of living organisms and their quirky adaptations. I also like writing about science and the people behind it, and have written news pieces for the Science Media Center, and contributed news, features and interviews for the CONNECT magazine based IISc. I am also a Japanophile. Groups comprised of multiple species are a very common occurrence in reef fish. These groups vary vastly in size, composition and duration of association. Despite the ubiquity of this behaviour in the reef, it is very poorly understood. I am studying mixed species grouping behaviour in reef fish in the Lakshadweep islands. The study aims to identify the species that participate in these groups and examine their interactions with each other. I am also interested in exploring spatial and temporal variation in grouping behaviour across the islands. In some sense, I have always wanted to be a marine biologist. In school, I had an inclination to biology and a deep sense of wonder and fascination when it came to oceans. And now, I’m lucky enough to be doing just that. I also love all kinds of sports and outdoor activities, gardening and science fiction. I study ecological and evolutionary mechanisms responsible for generating and maintaining species diversity, mainly in terrestrial plants. My PhD focused on the ecological drivers of large-scale patterns in species ranges, richness and turnover of tropical evergreen woody plants in the Western Ghats, India. I am also interested in understanding the historical processes that have played a role in shaping the present day distribution of plants in the Indian subcontinent. Currently, I am pursuing a post doctoral study that aims at understanding the systematics, biogeography and causes of diversification of a genus of primitive woody plants – Miliusa. I love exploring and observing nature and wildlife. Although I am interested in a wide range of organisms, I take a special interest in plants. I am fascinated by their diversity and ubiquity. I have spent most of the last 10 years studying, documenting and photographing plants mainly across the Western Ghats but also other parts of India. When I am not observing or photographing plants, I am mostly seen playing Ultimate, a sport that I have recently developed a deep passion for. Insights into an evolutionary radiation: causes and consequences of diversification in the Western Ghats Bush Frogs, 2014. My broad area of research is at the interface of ecology, evolution and biogeography. My PhD was on the diversification of bush frogs in the Western Ghats Escarpment. My current research - focussed on amphibians and reptiles - is on the processes driving diversification and diversity patterns in clades and the effects of these - along with dispersal and ecological processes - on the spatial and temporal patterns of diversity, range evolution, faunal assembly and endemism. I rely primarily on extensive field data, but also on genetics and ecological modeling, to address questions and draw inferences about evolution, ecology and biogeography. I started my work in the Western Ghats, but I have also worked in the Himalayas and Andaman and Nicobar Islands. During my PhD, I helped coordinate a project on the distribution of frogs, lizards and snakes across the Western Ghats, supported by CEPF. An online database and a field guide/atlas are currently in preparation. I also have a strong interest in disseminating research findings to the public. Read more. ​Causes and consequences of heterospecific foraging associations in terrestrial bird communities, 2013. Our current understanding of animal sociality comes, almost entirely, from a within-species context. However, there are many social benefits, e.g. protection from predators and finding food, which can, in principle, be obtained from conspecifics and heterospecifics. Based on our current knowledge, it seems that conspecific sociality is much more common than heterospecific sociality. But is this a real pattern? After all, most animals are surrounded by numerous potential heterospecific partners. I am trying to understand the conditions under which animals chooses heterospecifics over conspecifics as social partners. After completing a PhD on mixed-species flocks, I spent six months at the Wisenschaftskolleg zu Berlin. Since early 2015 I have been a postdoc. in Vishwesha Guttal’s lab in the Centre for Ecological Sciences, Indian Institute of Science. In addition to doing research, I teach a course on birds to Master’s students in Azim Premji University, edit a magazine called Current Conservation, and conduct interviews of scientists. 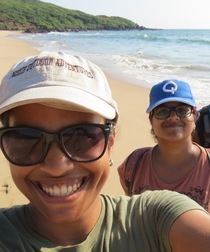 Sneha Vijayakumar, 'Understanding patterns of bird species distributions in the Western Ghats', 2014. Vidyadhar Atkore, Ph.D. student, ATREE, Bangalore, ongoing. 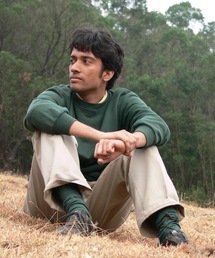 Aniruddha Marathe, Ph.D. student, ATREE, Bangalore, ongoing. Madhuri Ramesh, Ph.D. student, ATREE, Bangalore, ongoing. Nibedita Mukherjee, Ph.D., Vrije Universiteit, Belgium, 2014. 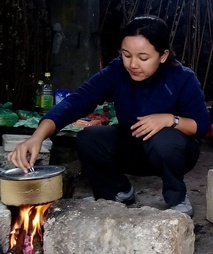 Katrina Fernandez, Ph.D. University of Tasmania, Australia, 2012. Chittaranjan Baruah, Ph.D. Gauhati University, Guwahati, 2012. Sayantan Biswas, Ph.D. George Washington University, USA, 2010.